Above Photo: Cooperative farming at Intervale Community Farm. Credit: Brian Shevrin. Across the U.S.—from New England to California—a small but growing movement of farmers is foregoing traditional farm ownership in favor of a cooperative model. 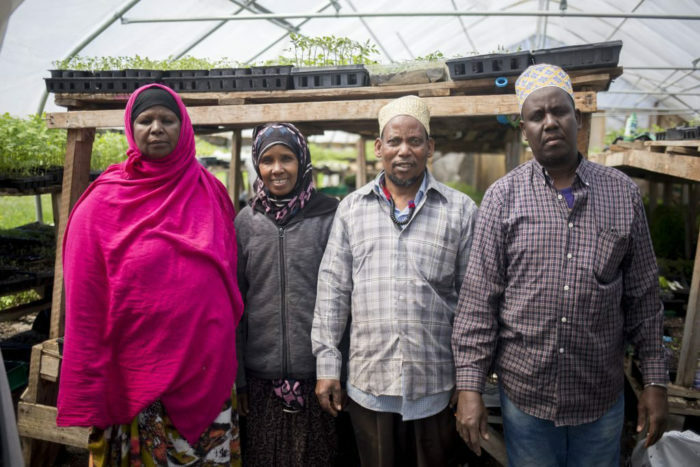 In Maine, four Somali Bantu refugees raise crops on shared land at New Roots Cooperative Farm, growing both regional and Somali produce. 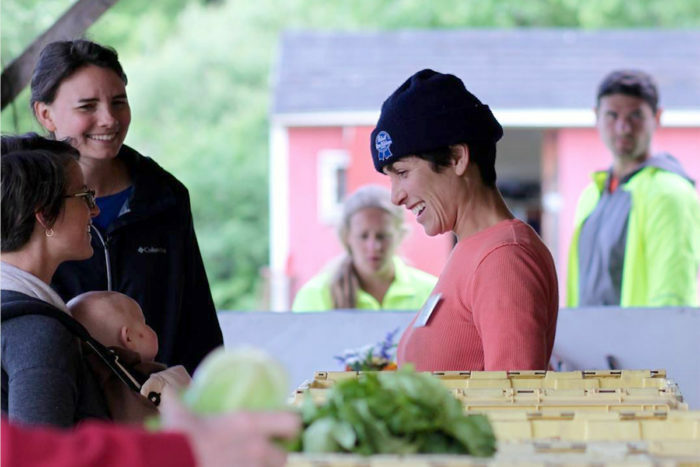 To the south in Vermont, Intervale Community Farm shares farm ownership with its community supported agriculture (CSA) members. Next door is Digger’s Mirth, a worker-owned farm. And across the country in Southern California’s Pauma Valley, Solidarity Farmshares work and resources with other stewards of the land. In the 19th and early 20th centuries, this connection was generally established through a community’s general store. Farmers gathered there to repair their tools and swap news. Men and women traveled into town from their farms, bringing eggs, butter, and produce to sell. The general store was the nucleus of rural life and an early model of the consumer cooperative. In 1920, 2,600 consumer co-ops—the majority of which were general stores—met locals’ needs, forged social bonds, and fostered community resilience. Though the general store has been largely been erased from the U.S. landscape, the cooperative tradition remains in other aspects of American life, from credit unions to food co-ops to farms. Civil Eats spoke to farmers from four row-crop farm co-ops about the benefits, obstacles, and future of cooperative farming. Farmer co-ops—which range from small to very large—have been around for nearly as long as people have been farming. But as worker-owned businesses undergo a revival, community-scale farmers are also turning to cooperative, more collaborative farming models. Farming lends itself to multiple cooperative models. Agricultural cooperatives, such as Organic Valley, are groups of individual farms that have come together to meet common needs, from inputs like seeds and fertilizer to services like distribution and marketing. Then there’s the consumer cooperative, in which customers (such as CSA members) own and govern the farm. 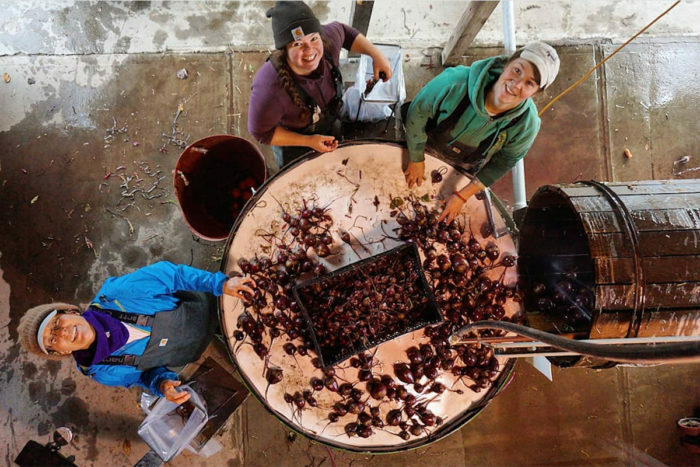 Worker cooperatives—a fairly new development in agriculture—refer to worker-owned farms. In particular, the worker cooperative model is a natural fit for farming. Beginning farmers need land, start-up capital, labor, and diverse skills to launch a business. In a cooperative, farmers can pool financial resources and strengths, thus spreading out costs and drawing from a range work experience. This means more adaptability and resiliency—two things any farmer will tell you are essential. Mai Nguyen supported new cooperatives for years at the California Center for Cooperative Development. Now the California organizer of the National Young Farmers Coalition (and a farmer of heirloom grains), Nguyen sees a growing trend toward cooperation in agriculture. “Like any other form of social relationship, cooperation is easily forgotten because it’s not commodified,” says Nguyen. 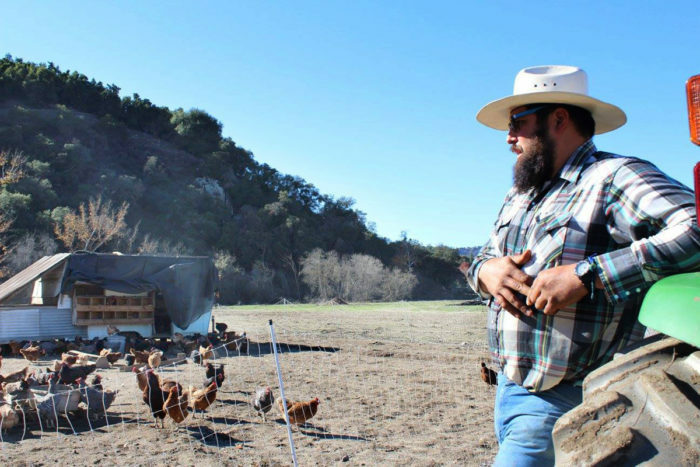 “There aren’t many well-established models of farms run by worker cooperatives—but that’s changing.” Through involvement in the co-op sector, Nguyen advises cooperative farms in California, including the collaboratively minded Solidarity Farm. While new farmers might be wary of sharing management with customers or co-owners, farms can function collectively with great long-term success. Take those two neighboring farms in Vermont, Intervale Community Farm and Diggers’ Mirth Collective Farm. This focus on service over profit gives the 30-year-old farm literal and emotional buy-in from community members. Intervale’s CSA serves around 600 households in the summertime; of these customers, 340 are co-op members and partial owners of the farm. This makes them “totally committed to the farm, in part because the farm is totally committed to them,” Jones says. 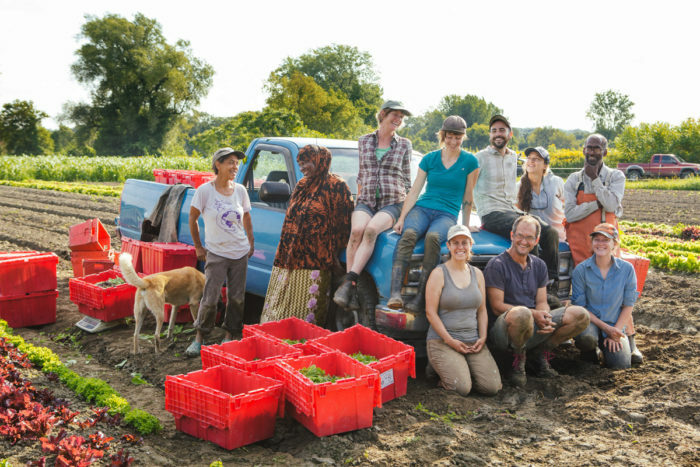 Because of this collaborative ownership, Intervale calls on its members for decision-making and support, from raising funds for new greenhouses to sticking with the farm through difficult seasons. When Hurricane Irene devastated the Northeast, “we lost all of our crops, and yet we had a ton of community support,” Jones says. Because Intervale had fostered a cooperative identity, CSA members stayed with the farm through its season of shortage. As all farmers know, those failures will come. Several days before I spoke to Ellee Igoe, co-owner of Solidarity Farm outside San Diego, the farm had suffered through its hottest day yet. Temperatures peaked at 121 degrees and Solidarity lost 70 percent of its chickens and 30 percent of its crops. Photo courtesy of Solidarity Farm. Part of the way they’ve built resilience is through fostering a collaborative spirit on the farm. Solidarity began as a worker-owned farm, though its owners didn’t go through the complicated process to achieve legal recognition. Instead, Igoe and Casavos shared ownership with two friends. When health issues and tuition payments forced their co-owners to take a step back, Igoe and Casavos decided to continue operating collaboratively, albeit without shared business ownership. As Igoe sees it, all farmers would benefit from adopting a cooperative model, sharing resources and responsibilities with other like-minded food producers. For their part, Solidarity rents land from the Pauma Band of Luiseño Indians, who are also farmers, and works with the tribe to steward Native land. They’ve invited other tenants to share this stewardship; today Solidarity operates alongside growers of sunflowers, apples, sprouts, and indigenous cover crop seeds. Igoe, Cavasos, and the other tenants share chores, such as watering and making deliveries, as well as resources from tractors to water. 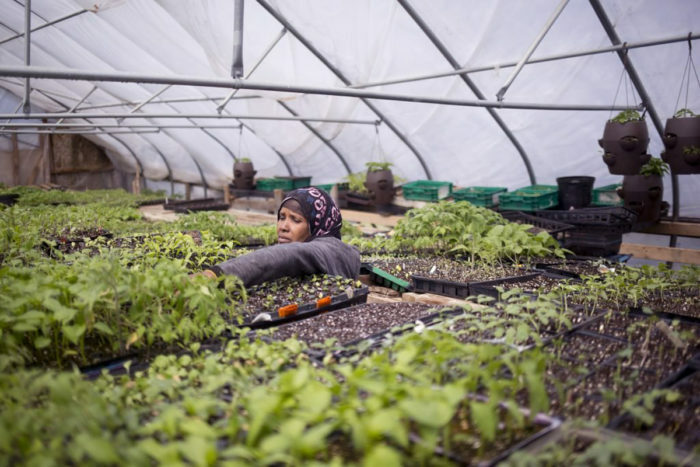 As refugees, the four Somali farmers face additional barriers to land, markets, and support. But farming collectively—which they’ve done since 2006—helps. “They are able to pool their resources and support one another in accessing the land, infrastructure, equipment, markets, and capital,” says Fertig-Burd. To date, the four farmers have raised over $100,000 to launch their farm. Mai Nguyen agrees. “I find that [among] people who come from countries where co-ops were developed and supported by the government, they’re more likely to develop,” Nguyen says. In their work with cooperatives, Nguyen has found that immigrant and refugee communities formed the most successful cooperatives. Many don’t want to rely on undervalued, undercompensated labor either. The cooperative farm model gives young farmers control over both their business ethics and their salaries. Young, worker-owned farms continue to take root around the country, with Flying V Farm in Placerville, California, joining the ranks earlier this year. Great, inspiring news! We need farms like these in every community. Turning our backs on the pseudo-food system will do great things for the health of the planet.